Strawberry Fondue is a light and refreshing (and super easy!) dessert that your family and friends will love – plus your options for dippers are endless! 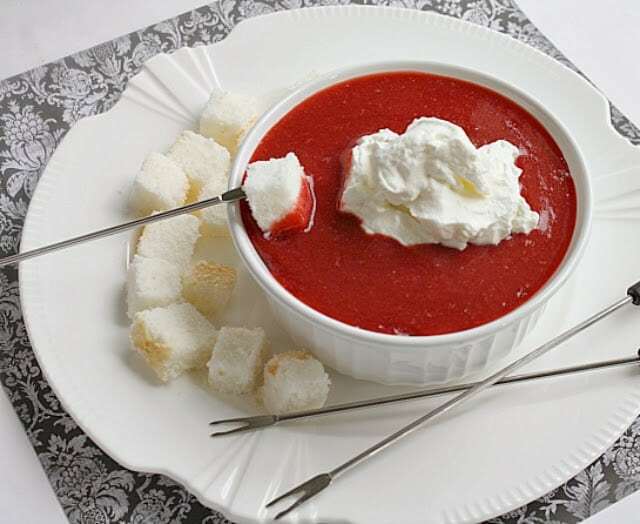 Strawberry Fondue is one of many fondue recipes that we love at our house! We love all kinds of fondue: chocolate, cheese, etc…but we usually stick to chocolate for dessert. But one day I came across this super simple recipe for strawberry fondue and was intrigued – I had to try it! And guess what…it is delicious too! You only need a few simple ingredients and the options for dippers are endless too – I tried angel food cake which was wonderful, but I think it would be amazing with bananas, mandarin oranges, brownie bites, and just about anything else! Be sure to also whip up some of the whipped cream recipe I mention below – having it really takes this recipe from great to incredible! Place strawberries in a food processor or blender and mix until pureed. Combine the cornstarch and water and then stir into the strawberry puree. Bring to a boil, cook and stir for 1-2 minutes or until thickened. Stir in the cherry juice. Enjoy! This fondue is wonderful warm, but I thought it was great when cooled also so either way works! Beat the ingredients with an electric mixer until stiff peaks form. If you love this Strawberry Fondue as much as we do, be sure to try a few of our other popular fruity recipes below! Strawberry Fondue is a light and refreshing (and super easy!) dessert that your family and friends will love - plus your options for dippers are endless! This is genius! I&#39;ve never even heard of strawberry fondue, but I would eat this with no hesitation! This is absolutely wonderful! How would you recommend making this with fresh strawberries? I accidently bought the wrong thing! My family doesn’t like cherries, so buying a jar just for some juice would be a waste. What does the cherry juice do? The cherry juice just adds a little bit more flavor, but you could definitely leave it out or maybe swap in a little bit of cherry extract (1/2 tsp) or perhaps even 1/2 tsp of almond extract. The strawberry flavor is definitely the dominant flavor so either way, I’m sure it will turn out great!